A City So Grand, The Boston Italians, Due to Enemy Action, and Dark Tide. 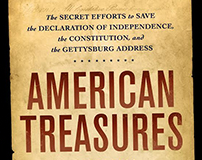 Kirkus Reviews, one of the preeminent reviewers in the book industry, offers a pre-publication review of American Treasures. Kirkus describes Steve’s sixth book as “a solid retelling of an inspiring story,” and “a novel perspective on American history that focuses on the story of the country’s founding documents and the Americans who composed, safeguarded, and preserved them for the benefit of future generations." "This unique, easily digestible, and well-researched saga is ideal for general readers"
"American Treasures delivers a captivating (and absolutely true) historical account of the priceless documents that have shaped America as a nation and the often-untold stories of patriotic acts to defend them." Steve Puleo's sixth book, American Treasures, is a sweeping history of a nation united to preserve the values embodied in its founding documents. My latest news, thoughts, messages for readers, and responses to questions. Click below to see the complete blog! Stephen Puleo is an author of six narrative nonfiction books, a historian, teacher, public speaker, and communications professional. Enter your e-mail address below to receive updates from Steve. © Copyright 2019 Stephen Puleo.